A mixture of 30,4 g DL-mandelic acid (0,2 mol), 30 ml toluene, 30 ml EtOH (preferably absolute) is heated on a water seperator facility. Upon completion of the water seperation (after a good hour) it is heated for a further hour (about 5 ml will be desposited at the attachment of the drying tube on the cooler). The cooled reactive mixture is combined with the contents of the seperator (the distilling flask is cleaned with a little toulene, this then being added) and is then washed to about one half of its volume successively with H2O, a 4% NaHCO3 solution, H2O, whereby beforehand about 1/4(v/v) of the total NaCl solution has been respectively added to the washing solution in order to avoid a loss in product and to limit emulsion formation. Without drying the organic phase is rectified in a vacuum. Entrainer, water and alcohol are removed via a weak water jet vacuum. With a strong water jet vacuum (Kp. 253-255°C at normal pressure) the product is distilled off, only a a little tarry liquid remains in the slough (due to the high boiling point of the product the apparatus should be perhaps insulated with aluminum foil). The DL-mandelic acid ethyl ester remains as a clear, slightly oily liquid, which when warm has a pleasant scent. The yield is 29 g. (80% of the theoretical amount). 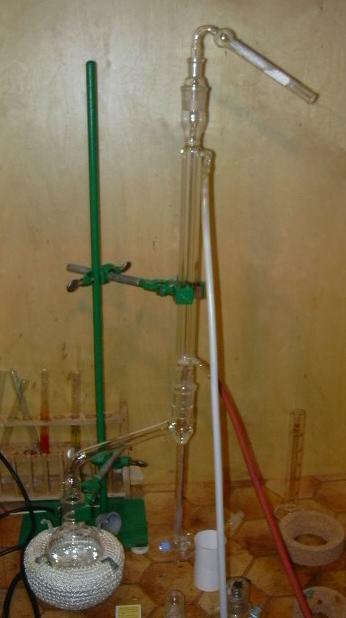 Distillation of the product mixture in a vacuum. 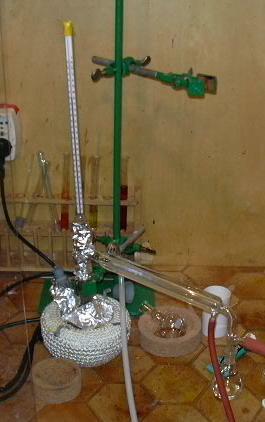 To be observed is the insulation of the left part of the apparatus with aluminum foil.